Tony Cosey had his first success in running when he broke his friend’s middle-school mile record in eighth grade. The following years at Central High School and through his participation in the Knoxville Track Club (KTC) Youth Athletics Program, he began to lay the foundation for his professional running career. In 1991, Tony was the Amateur Athletic Union (AAU) Nationals (Young Men’s Division) runner-up in the 1500 meters (3:59). Also in the 1991 AAU Nationals, Tony anchored KTC’s National Championship 4×800 relay (7:52). At Central High School in Knoxville, Tony was state champ in Cross-Country in 1990-1991 and state champ in the 1600 meters in 1992 and 3200 meters in 1991 (four state championships and two state records: 1600 meters (4:11), cross-country (14:54)). He was 12-time Knoxville Scholastic League (KIL) champion between cross-country, 800 meters, 1600 meters, and 3200 meters. On the national level, Tony was a Footlocker Cross-Country National All-American in 1991, and a four time McDonalds All-American. Tony was ranked top ten in the country for both the 1600 meters and 3200 meters in high school. In 2012 the Knoxville Scholastic League (KIL) girls and boys 1600 meter was named after Tony, as well as the following year the Tri-Cities Invitational, a Nike National Elite meet, named the boys and girls 2000 meter steeplechase after Tony. He was a 7-time All-American for the University of Tennessee Track and Cross-Country team in the indoor 3000 meters, outdoor 5000 meters, outdoor 10,000 meters, and the outdoor 3000 meter steeplechase. At the 1995 NCAA Cross-Country Championships, he placed 28th in 1994 and 7th in 1995. 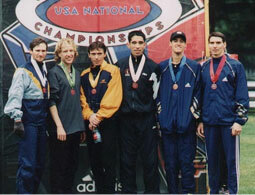 In the SEC Cross-Country Championships, Tony was 4th in 1993, 3rd in 1994 and 3rd in 1995. In the NCAA Championships, Tony twice finished 4th in the indoor 3000 meters, finished 5th in the outdoor 10,000 meters and 9th in the 5k and 4th in the steeplechase. In addition, Tony was Mt. SAC Relays Champion, Penn Relays Champion, both at the 3000 meter steeplechase as well as an SEC and USA National Champion in the distance medley relay. After his UT career, Tony competed in the 1996 Olympic Trials and became a professional athlete after signing his first contract with Adidas. He represented the USA in three World Cross-Country Championships. In 1997, he competed in the World Goodwill Games, and in 1998 he represented the US in the World University Games. 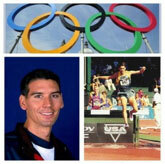 In 1998, Tony took 3rd place in the 3000 meters at the US Indoor Track Championships. Tony’s personal best in the steeplechase came when it mattered most — when he ran 8:21.41 in the 2000 Olympic Trials, where he finished 3rd and qualified for the 2000 US Sydney Olympic team. In the 2000 Sydney Olympics, Tony finished 10th in the semi’s with a time of 8:35.25 and 24th overall. He is the only Knoxville-born track Olympian. Tony also found success in road racing finishing in the top 10 multiple times in distances from 5k through 15k. Some of his best finishes include the 1996 Governor’s Cup 8k placing 1st with a course record of 23:29. He was top 10 at Gate River Run 15k from 1997-2001. At the 1997 Crescent City 10k he finished 7th. One of his best road races came in 1998 at the Falmouth 7.1 mile race where he placed 18th but was the 3rd American overall. Council (AAC), and served on the Road Runner Council, Long Distance Executive Committee, and Cross-County Executive Committee. He was one of three athletes to organize and incorporate the Professional Athletes Association (PAA) organizing the USA professional track and field athletes union in 2006. Locally, Tony also served one year on the Boys & Girls Club Advisory Council. In addition to serving on these various boards and juggling his professional running career, Tony was also a Volunteer Assistant for the University of Tennessee Men’s Cross Country and Track Teams for 1 year and a Graduate Assistant Coach for another year. During this time he also attended college full time and achieved his Masters Degree in Management. Currently he is owner and President of Cosey Financial Services, Inc., a local money management firm he founded in 1999. As well as his professional career he has been the head coach for both cross country and track and field at Christian Academy of Knoxville for 4 years, having won a TSSAA State Championship as a coach as well. Tony was inducted into the Greater Knoxville Sports Hall of Fame in 2006, and inducted into the Knoxville Track Club Hall of Fame in 2014. In 2015 He was inducted into the Central High School Hall of Fame. He and wife Kathryn have three children, Taylor, Mason, and Baker. Founder and President of Cosey Financial Services, Inc. a Registered Investment Advisory firm from 2002 to present. President of On-Belay Foundation, LLC from 2013 to 2015. Founder and President of Cosey Insurance Services, LLC from 2010 to present. Cosey Financial Services and Registered Representative of Silver Oak Securities, Inc., (SOSI) Jackson, TN from 2008 to present; SOSI is a registered broker/dealer member FINRA. Cosey Financial Services and Registered Representative of Securities Service Network, Inc., (SSN) Knoxville, TN from 2004 to 2008 ; SSN is a registered broker/dealer member FINRA. Registered Representative of American General Securities, Inc., (AGSI) Knoxville, TN from 1999 to 2004; AGSI is a registered broker/dealer member FINRA. Professional Athlete and USA representative Internationally for Track and Field. Primary 1099 contracts included Adidas and American General with various other smaller sponsorships from 1996-2003.